Take a peek at the peak, write on your site about the sight. - Crochet, Starbucks and roadtrips, oh my! Take a peek at the peak, write on your site about the sight. We had a memorable Fourth of July this year! At around 1, Nicoal arrived and we went out to Nearly Normals for lunch. They were reeeeeallllllly slow. Like almost 45 minutes from ordering to eating. But the food was yummy. After lunch we hung out at home for a bit until Cory's friend Mike and his girlfriend Angela arrived, and then we set out for Marys Peak - a bit early because we weren't sure what to expect as far as parking availability on a popular holiday. 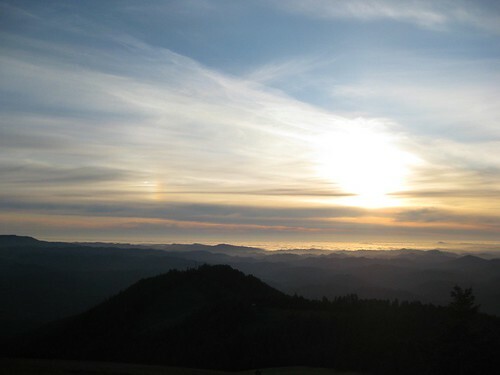 Marys Peak is west of Corvallis, the highest point in the Coast Range at 4097 feet. It takes about 40 minutes to get to the parking lot, and then it's a 1.5-mile hike uphill to the summit. 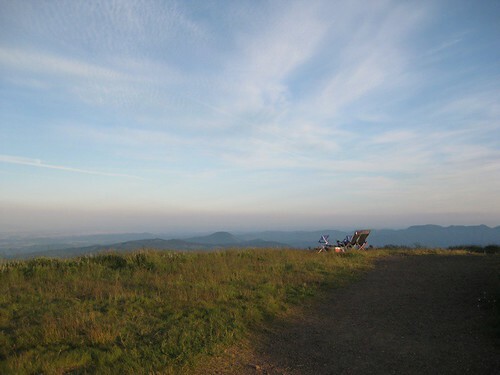 There's another grassy area closer to the parking lot that also boasts some pretty good views of the Willamette Valley, but if you also want 360-degree views the summit is the place to go. Mike and Angela followed us up, and we donned our packs and started up. My pack was pretty heavy, with three thermoses of coffee and three bottles of water, along with some food and jackets and other various things, and it didn't take long before I was hot and sweaty and out of breath. And we hadn't gotten to the steep part yet. But one can't get into shape by not working, I suppose, so in the end I was happy to get that exercise. When we reached the top, we took a breather and then set up our little vantage point. We set up our camp chairs and blankets and ate some KFC that Mike and Angela brought, and other snacky things. It was much cooler up there than on the valley floor, and we had to start layering pretty quickly. I played a game of cribbage with Cory and Angela to teach her how to play. 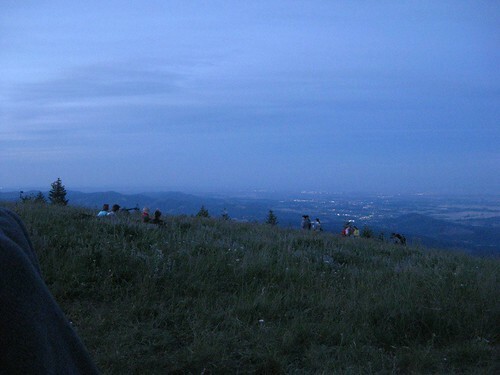 As the sun started to go down, we all walked around the summit taking photos of the deepening light and watched people start to join us on the grass and lupine. The sun had gone down but the sky was still pretty light, but it sorted itself out soon enough and we were able to finally see where the cities were, once the city lights came up. We could see Salem, Albany, Corvallis, Philomath, Lebanon, Harrisburg, Springfield, Eugene, and I'm sure a few other places as well. And then the fireworks started, the official ones in Salem and Corvallis and Eugene and little home-made shows too. They were teensy little things, but pretty neat to see from way up on the Peak, and we could barely hear little muffled booms too, though usually the voices of the people around us drowned them out. It was over pretty quickly, and so we packed up by moonlight and started down the trail to the parking lot, nobody saying much of anything like most trips home tend to be. Mike and Angela headed for home straight from the lot, and Nicoal came home with us. We got home around midnight, and all of us fell into bed. It had cooled off really quickly, too, which was nice because we'd forgotten to open the windows before we left and the house was stuffy. But we made short work of the stuffiness. This morning, because Nicoal had to leave earlyish, she and I got up early and made blueberry pancakes with blueberries we got yesterday and ate them on the patio in the cool morning air. It was great - I love my patio but not when I'm all by myself out there, so I don't go out there for meals as often as I'd like. And then Nicoal went home and Cory and I have been spending the rest of the day being quiet and still. :) All in all, it was a great 4th and a great weekend, and I'm glad to have spent it with good friends!